The rest day can do funny things to the legs of pro cyclists. 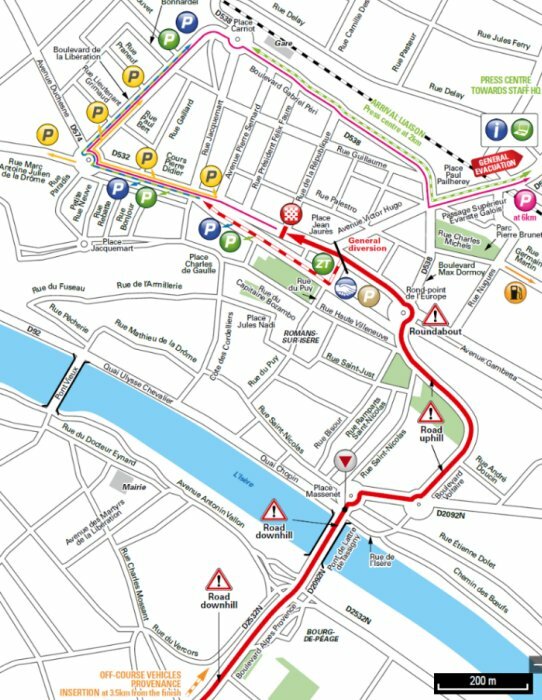 Paris is now very close, but fatigue will kick in big time in this final week and a stage that begins with 20km of climbing from the flag drop isn’t going to be welcomed by most riders, especially those sprinters who may be eyeing up the flatter finish to this stage. Marcel Kittell will be one of these riders and we’d expect the teams of Degenkolb and Matthews to really force the pace hard up to the summit of the 3rd cat Côte de Boussoulet. The current green jersey holder isn’t a fan of climbing at the best of times, unlike Matthews who is working his socks off sweeping up intermediate sprint points after needing to climb cat 1 cols. His win on stage 14 has brought him within 100 points of the big German. It’s still a long shot that he can overhaul him, but he is guaranteed to try his damndest. After this first climb, the roads undulate for 45kms, culminating with the cat 4 Col du Rouvey. If a gap has been formed during the early stages of the race, then these roads will make it hard for the peloton to reel it back in before the 50km descent, which is untechnical and so will be taken at high speed. Crosswinds could also play a part here, which will keep the GC teams on alert and we could see a repeat of Stage 11 last year when Froome and Sagan comically contested the stage finish after the race had been blown to bits. The finish town has also featured recently, in last year’s Paris-Nice. It’s a tricky up and down final few kms, with a sweeping bend and roundabouts placed to disrupt the sprint trains and positioning of the key men contesting the win. The final km is predominantly uphill and in last year’s race to the sun Nacer Bouhanni powered to the win, beating Edward Theuns, André Greipel, Alexander Kristoff and Michael Matthews. Bouhanni isn’t at the same level of form and we don’t expect the result to be repeated. If Kittel can be distanced, and we think there’s a strong chance he will be, then we’d expect Matthews and Degenkolb to be the men to beat. If Matthews wins here and Kittel scores low down, or not at all, then it will make the final few days of the Green Jersey competitions very interesting. Kristoff, like Degenkolb, has been riding into form and is another sprinter who doesnt mind a slight up hill drag to the finish. Naesen would be our dark horse for this stage, The Belgian champ is no slouch sprinting up hill, but if crosswinds are feared he may be called into action to help Bardet protect his GC place.